Revenge has been absolutely decimating everything in their path for the better part of fifteen years, with duo J. Read and Vermin’s exploration of destructive and unrelenting metal going even further back through bands like Conqueror and Axis of Advance. At this point in their career Revenge has got their attack down to a science, but that doesn’t mean that fifth album Behold.Total.Rejection doesn’t bring some surprises with it. Right from the very first note there’s a fuller sound on display that amplifies the power of both the drums and vocals further than ever before, and it makes the material so razor sharp that you’ll be close to bleeding out from the wounds before the album’s even halfway through. The majority of Revenge’s previous material was engineered in a similar manner, merging the guitar, bass, and drums together into a dense wall of sound that was raw and uncompromising. Behold.Total.Rejection has a bit more separation by comparison but that hardly means that these guys have softened their blows at all, as the fullness of the recording has been used to make the drums sound like battering rams that feel like they could rattle foundations at higher volumes and sharpened the guitar/bass combination to tear through your eardrums even faster than before. It’s a sound that works perfectly for the relentless blasting and chaotic structures once again on display, as J. Read’s frantic drumming is always shifting and throwing in unpredictable fills and tempo changes which continues to put the standard blasting style that is typical in both black and death metal to shame. Behold.Total.Rejection is the longest full length that the band has written to date, coming in at six minutes longer than Scum.Collapse.Eradication, and while you might initially think that repetition might start to sink in during some of the lengthiest arrangements the subtle shifts and chaotic transitions prevent that from happening. Whether it’s a lumbering mid-tempo break where the drums sound like earthquakes or blistering death metal style guitar solos that appear out of thin air, Revenge once again demonstrates that there are specific sections capable of drawing your attention underneath the destructive and primal energy on display. It really doesn’t matter if you choose to categorize this as black, death, or war metal, because this is as extreme and raw as any of those metal variants can get. Since Pete Helmkamp’s departure following the release of Infiltration.Downfall.Death, J. Read has been handling all of the vocal work on Revenge’s records and demonstrated over the years just how filthy and barbaric of a pitch he has. Some of the previous albums have chosen to bury Read in the mix a bit, but this time around his vocals are more prominent than ever and that plays a large role in the ability of these songs to tear through your speakers and genuinely intimidate you as you listen. There’s a regular switchover between shrill screams and low gurgles and growls that reverberate over the instrumentals with precision and grit, adding that extra layer of grime and utter filth that has become a characteristic of Revenge’s style. Compared to its predecessor it seems like there is even more of an emphasis on the lower pitches this time around, and this may be the most inhuman that the vocals have ever sounded. With the drums and vocals now towering over the whirlwind of guitar and bass riffs this band has reached truly apocalyptic proportions, and it’s hard to believe that this far into their career they’re still finding additional levels of intensity to squeeze out of their recordings. With each album it seems like Revenge has reached a peak level of utter chaos and black/death metal supremacy, but they keep finding additional nuances to tweak and continually prove there is still room left to push the most extreme and raw metal variants further. 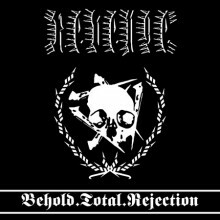 Behold.Total.Rejection does that by bumping the production up slightly and giving the drums and vocals more weight than ever before, allowing elements that were buried a bit further back in the mix previously to play a larger role in the attack. Combine that with another dizzying display of down-tuned blasting and unrelenting riffs courtesy of Vermin, and you have another release from Revenge that cannot be matched by any other band.